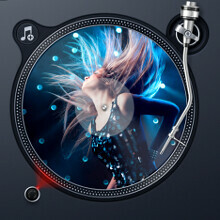 Ever wanted to be your own personal DJ at a party from the comfort of your Android phone? Well, djay was recently ported to Google's mobile OS, quickly becoming the most popular such app there, and the app is now free. Besides DJ tools for mixing and playlist-ing, it includes Spotify integration, giving you access to many more millions of tracks, but the app can also dip into your own music library. The iOS app is sleek and polished, but djay for Android is no less, though it takes quite a lot of memory, so fitting it in the background would be flawless on more powerful handsets only, that's why you might see some performance complaints in the reviews. Other than that, the app indexes your own music, adds the Spotify database to it, and sports turntables and automixing features that are as easy to work with as possible on a smartphone display. Plenty of other stuff is in store, too, like a sampler with included sound FX, drums, and even a Snoop Lion pack, as a djay exclusive. In the US Play Store there's a free and paid version of the app. It's a good app. It just needs Play Music integration. PA and their misleading titles lol .